The citizen's experience with the institutions of governance usually leaves much to be desired. In many parts of the world, people dealing with government agencies have to engage in dreary and time-consuming activities they would much rather avoid. 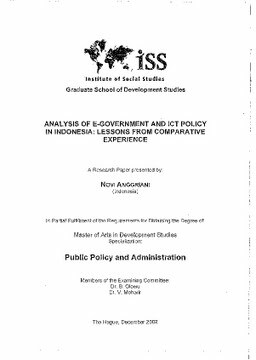 The growing complexity of the society requires improvement of public administration performance. The growth and development of new Information and Communication Technology (ICT) give a new opportunity for this. As Slevin (2000:1) argues, the rise of new media, spearheaded by the Internet, is beginning to contribute significantly to the complexity of the channels of communication in an uncertain modern world. If we wish to understand the transformation taking place in modern societies, we must recognize the central role such media play and are aware of the impact they have (ibid).